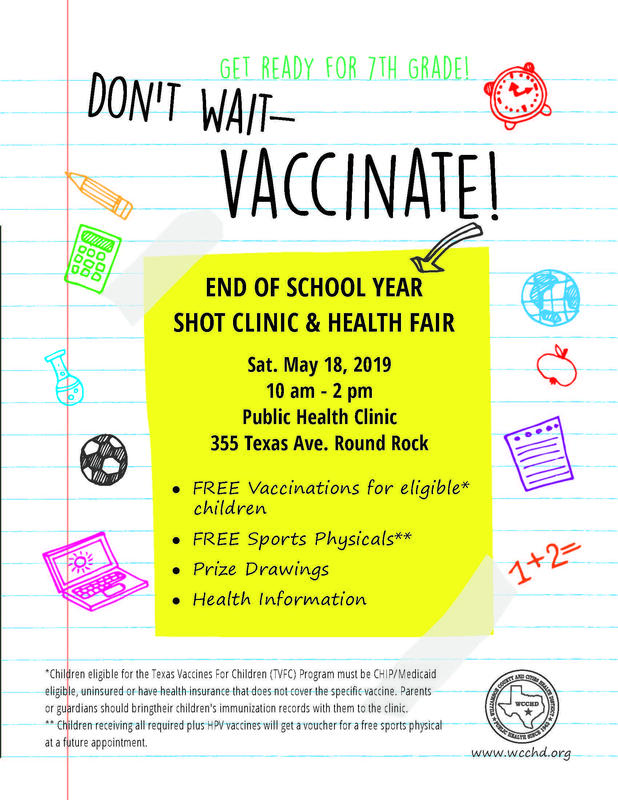 The Williamson County and Cities Health District is offering free vaccinations and sports physicals to eligible children on May 18. The event will be held from 10 a.m. - 2 p.m. at 355 Texas Ave. in Round Rock. Children eligible for the Texas Vaccines for Children (TVFC) Program must be CHIP/Medicaid eligible, uninsured or have health insurance that does not cover the specific vaccine. Parents or guardians should bring their child's immunization records with them to the clinic. Children receiving all required vaccines (plus the HPV vaccine) will get a voucher for a free sport's physical for a future appointment.